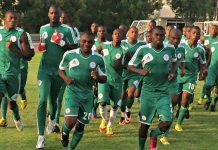 The Federal Government has thrown its weight behind the mobilisation of non-state resources for the Super Eagles’ participation at the 2018 FIFA World Cup scheduled for Russia for betweenJune 14 and July 15, 2018. 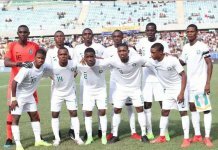 At a Fund Raising Gala night for the Super Eagles held at the Banquet Hall, State HouseÂ Â in Abujua at the weekend, Minister of Youth and Sports, Solomon Dalung, noted that preparation and participation of national teams in regional and international sports competitions had sometimes been marred by funds constraints. The minister said that challenges of funding had limitedÂ the preparation, welfare and motivation of sports men and women, resulting in poor performance and under-achievement, hence the need to seek alternative funding sources for the teams. “We are prepared to change this unsatisfactory outcome with presidential support and guidance, as well as stakeholdersâ€™ engagement and buy-in. “Knowing very well that government alone cannot shoulder all sports expenses, we have decided to strengthen our collaborations with the private sector to mobilize non-state resources. Â “We are equally focused on ensuring that funds mobilised are judiciously used to facilitate and boost the participation of the Super Eagles in the tournament. â€œWe are determined to operate in line with our Change Agenda and Mr. Presidentâ€™s anti-corruption posture,” he noted. A budget for the Super Eagles preparations and participation at the Russia FIFA World Cup final is estimated at N3billion out of which N1.5billion is expected from government, and the balance of N1.5billion is proposed to be generated through fund-raising efforts. Â Among the donors at the event were; AITEO who gave N50m, businessman and Chairman of Atlas Oranto Petroleum, Chief Arthur Eze who donated N25m while Abia and Kano states announced N5m respectively. Lagos and Kebbi states including Total Nigeria did not publicly disclose their donations. Three former members of the Super Eagles, Samson Siasia, Waidi Akanni and Augustine Eguavoen in conjunction with the Ministry of Youth and Sports and the Nigeria Football Federation are spearheading the fundraise drive.